Our trip began with an afternoon flight out of Calgary. We were picked up at home by the airport shuttle at 4:00 PM and arrived at the airport by 4:30. Checkin and security went smoothly, so we had a bit of a wait for our 7:30 flight. The Air Canada flight was long, but on time and we landed at LHR (T3) at 11:00 AM. We claimed our luggage and did customs (EU) without incident. Then we did the long hike in the LHR tunnels to get to T1. Our next leg was British Airways to Dublin. We checked in with BA and had only a short wait until boarding at 1:30. We arrived in Dublin at 2:30 (quick flight!). We once again had to go through customs (not sure why - EU to EU). We hiked outside to the bus stop area and found the "Airlink Airport Express" bus that would take us to downtown Dublin. We had booked two nights at the Marker Hotel and asked the bus tocket guy how to get there. 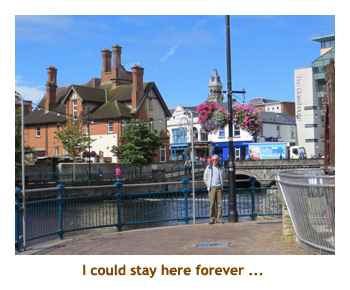 He hadn't heard of the hotel so looked at the address. He sounded very unsure but gave us instructions on a map on how to get there. Not trusting his info, we asked the bus driver the same thing and he gave us directions to a very different place! 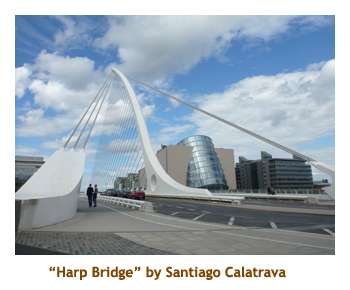 We trusted the driver and got off the bus at the new "Harp Bridge" - officially the Samuel Beckett Bridge (designed by Calatrava - our Calgary Peace Bridge guy). We crossed the bridge and then asked another bus driver how to get to the Marker. He was also unfamiliar with the hotel and used his GPS. It turned out that we were only a block from the hotel. It was a brand new hotel in a very new section of town which is why the locals had not heard of it. Right next door was a new theatre where "Cats" was currently playing (or coming soon). We arrived at the hotel just after 4:00, but our room wasn't ready and they sent us to the bar for a free drink. We waited about 45 minutes or so until they told us that our room was ready. It was nice to finally have a place to flop! It was dinner time locally, so we decided to head out for a quick bite. We popped down the street to Milano's Restaurant for a warm veggie and goat's milk cheese salad. Then it was back to the hotel to check out the roof top bar - what a great view of the city! By 8:00 we were pooped, so headed off to bed. Note: While walking around looking for the hotel, we noticed mobs of people in football, rugby and hurling colours flooding towards who knows where. 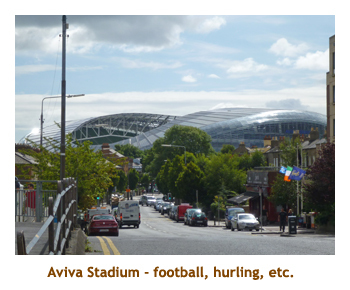 It turned out that nearby was the Aviva Stadium and there was an exhibition soccer match (the Dublin Decider) between Liverpool and Celtic. The stadium holds 51,700 people and they were all downtown before the game. Everyone walks to the game and visits the bars along the way! We had an OK sleep and woke up early to a sunny day. We decided to walk to Grafton Street (maybe a mile) to try a breakfast place we had heard about (Bewley's). It was OK - a European approximation of a North American breakfast. I had 4 tiny blueberry pancakes. We walked back to the hotel and then headed out about 10:30 on the Ho-Ho bus (which stopped about a block from our hotel!). The bus route was in two segments, so we had to change buses a couple of times to do the complete route. 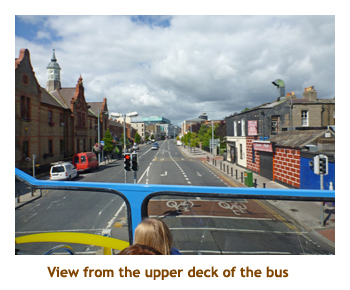 The first change was at O'Connell Street near the Dublin Spire.where we left the Docklands bus and climbed aboard the main bus. 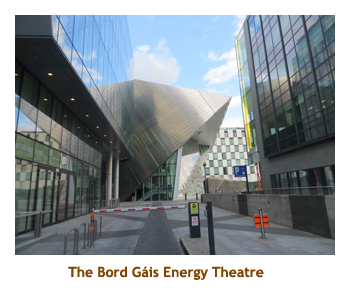 The bus took us around the entire downtown area of Dublin including up and down both sides of the River Liffey. 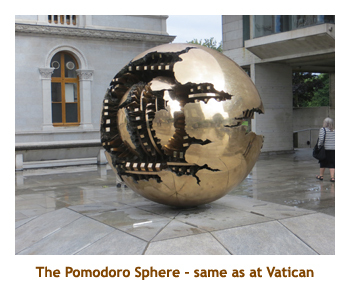 We had done this same trip several years ago, so we didn't stop at Trinity College, Dublin Castle or St. Patrick's Church this time. 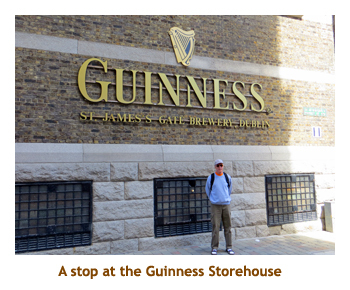 Our first stop that we made on the main route was at the Guinness Storehouse (a repeat from our last trip) to check out souvenirs for the kids. However, it turned out that there was no access to the gift shop without first going through the museum. As good as the museum was, we weren't interested doing it again, and there was a huge lineup to get in. So we hopped on the next bus to continue our tour. The tour took us to Phoenix Park and then along the river. We had thought of stopping at the zoo for a while, but then decided against it. 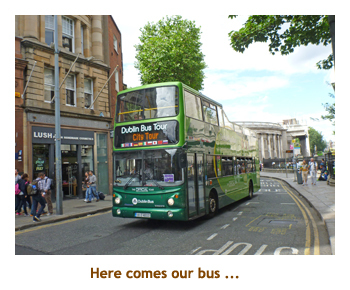 When we completed the loop to O'Connell Street we decided to do the loop again. 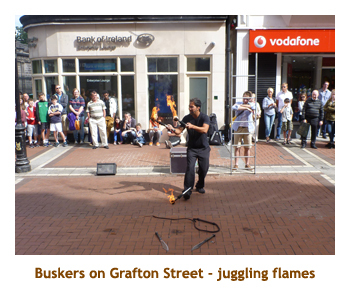 This time we stopped at Grafton Street to browse the shops and watch the buskers. Then we re-hopped and enjoyed the complete loop back to O'Connell Street. There we wandered along the main street and browsed the shops (mostly souvenir shops). Finally we hopped back on the Docklands bus for the tour back to our hotel. We were back by about 5:00. For dinner we went next door to the Ely Restaurant. I had a seafood linguini with scallops and shrimp. It was quite spicy. We wandered around the canal area for a while and then packed it in for the day. Note: Once again, when we were on O'Connell Street, mobs of people in hurling colours were flooding the downtown area, heading in different directions. They were off to Aviva Stadium (again!) for an All-Ireland semi-final hurling match between Cork and Dublin. Today was the day that our Ireland tour officially started. We would have to relocate from the Marker to the Double Tree to meet our tour group. We were up early and did breakfast at a nearby restaurant. Afterwards we checked out of our hotel and marched off with our luggage. 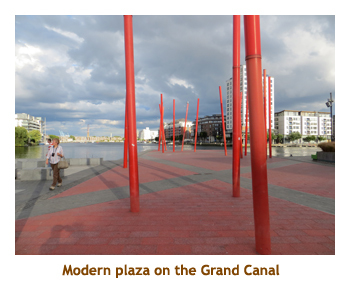 The walk to the new hotel was about a mile due south of the Grand Canal Square. It took us about 45 minutes to walk it dragging our bags. Most of the way we were following along a narrow canal which was quite pleasant. The canal was lined with trees and had two or three small locks along the way. Two river boats were making their way up the canal. Finally we came to the street where the hotel was supposed to be. We had problems finding the hotel for two reasons. 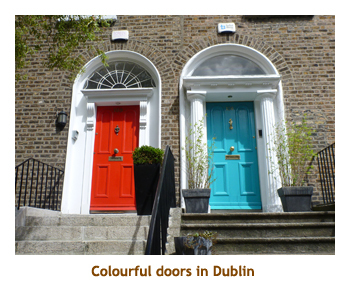 Firstly, the hotel was on Sussex Road, but the address was on Upper Leeson Street. 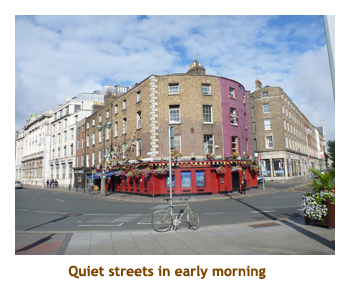 The hotel was not visible from Upper Leeson Street! Also, the hotel was in the process of changing names from the Burlington to the Double Tree. Therefore, locals we asked directions of weren't sure which hotel we were looking for. Somehow we found it! We checked in and then headed across the street to a small deli (Rigby's) for lunch. We had soup and shared a huge sandwich. It was very good. Then it was back to the hotel to join the group on our first tour - around Dublin. The bus tour took us essentially on the same route as the Ho-Ho bus did yesterday (twice) so we felt quite at home. 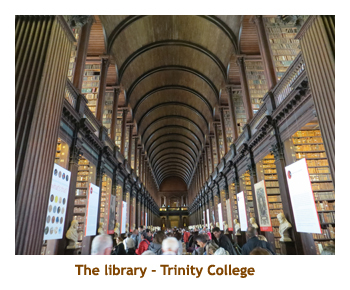 Our one stop was at Trinity College to visit the ancient library and see the Bool of Kells. 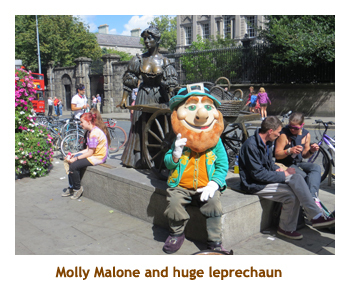 On our previous visit to Trinity College we had skipped the library due to the long lineup. This time there was a lineup but it moved quickly. That was good as by now it was raining a bit. Inside we toured the wonderful library with thousands of ancient volumes in two story high racks. The Book of Kells and three other documents were visible in a special glass display case. Then we drove back to the hotel for a group dinner. After the dinner, we wandered around the hotel area which was mostly residential. We had an early morning coming, so packed it in early. Note: we much preferred the Marker Hotel. The DT was more rundown and there was a lot of construction and renovations on the go. Our wake-up call was at 6:45 this morning. We were awake about 15 minutes earlier, so it wasn't a shock. Our bags had to be out in the hallway by 7:30 to be loaded onto the bus, and the same time to report for the buffet breakfast. After eating we checked out of the hotel and boarded the bus for an 8:30 departure on an optional tour. 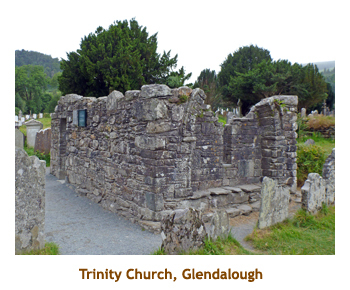 Instead of heading north towards Belfast, we headed south, through the Wicklow Mountains for a morning excursion to the ruins of Glendalough. 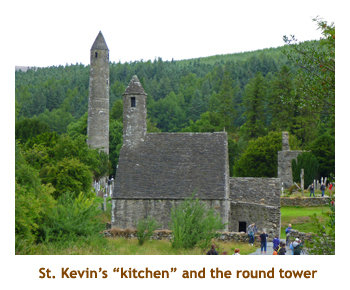 This was the site of an ancient village founded by St. Kevin (Saint C�emgen in Irish) in the 6th century. 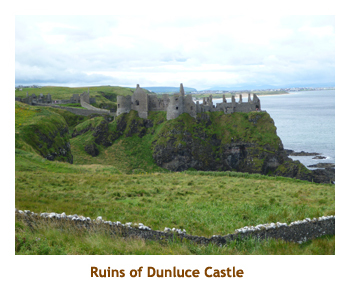 The surviving ruins date from the 10th to 12th century. 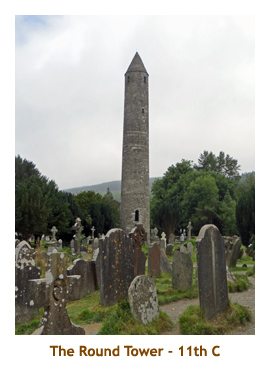 The most famous structure there is the 11th century, 33 meter high round tower. 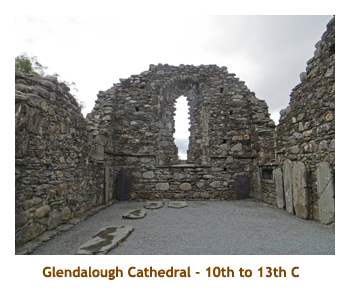 There are also the remains of seven different cathedrals and churches. At the visitor's center, we were presented with a short movie that explained the site and had some time in the interesting museum, before being taken through the actual site by a local guide. It was very interesting. It was also very cool, with a temperature of 14 degrees and cloudy. Isn't this August? Our way back to Dublin was by a more coastal road, passing the Great Sugar Loaf Mountain. We were back to the hotel by 11:30 and were given 45 minutes to grab some lunch before rebaording the bus for Belfast. We hustled around to Rigby's (again) and grabbed a turkey sandwich. It was excellent. At 12;15 we set off for Belfast. 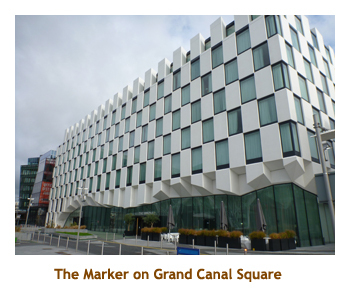 Our route through Dublin took us by our Marker Hotel and the Grand Canal sarea that we were quite familiar with by now. Then	it was on to the motorway for the drive to Belfast. As we drove north, we entered the Valley of the River Boyne (site of the Battle of the Boyne) where William of Orange defeated the Catholic King James in 1690. We did a pit stop at a service station at the halfway mark. 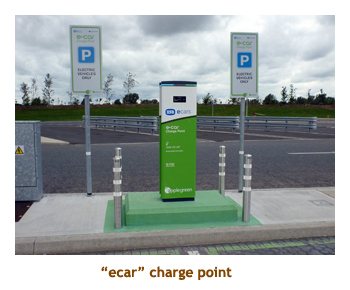 We noticed the recharge units for electric cars. 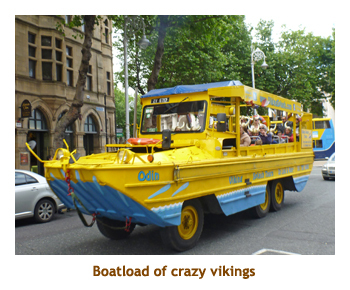 They turned out to be available all through Ireland, but we never saw a car hooked up. We continued through the village of Drogheda and then crossed the (invisible) border into Northen Ireland (Ulster). Paralleling us were the Mountains of Mourne. We arrived in Belfast at the Europa Hotel by just after 4:00 PM. 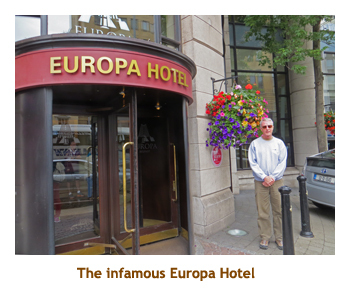 The Europa has the dubious distinction of being the most bombed hotel in Europe, thanks to the IRA troubles. Ignoring the dangers, we checked in and then headed across the street to Tesco for some snack goodies. Well before our trip started, we had contacted our friend Bill from Larne and arranged a get together. He did the train in from Larne and met us at 6:00 at the hotel. We had a drink in the bar and then walked a short distance to Robinson's Pub where I had my first beef and Guinness pie. 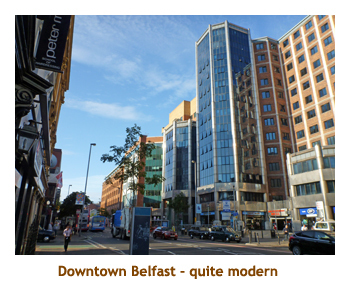 Then Bill took us on a walking tour of the downtown area of Belfast. It was a very nice evening and so wonderful to visit with Bill again. He left us about 9:00 (an hour ride back!) and we headed off to bed. 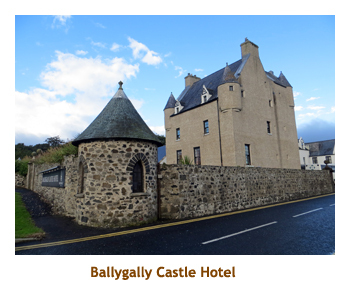 Note: When Bill asked us where we would be staying the following night, we mentioned Ballygally Castle. That was only about 10 minutes from Larne! So we agreed to meet the next evening as well. 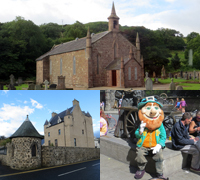 Today was a short distance to travel, but packed with things to see and visit. The usual process was 6:45 wake-up, 7:30 for luggage and breakfast, checkout, and 8:30 to be onboard the bus. 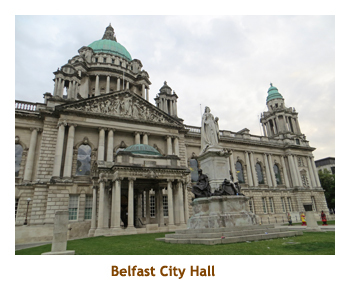 Our first part of the day was a sightseeing tour around the city of Belfast. 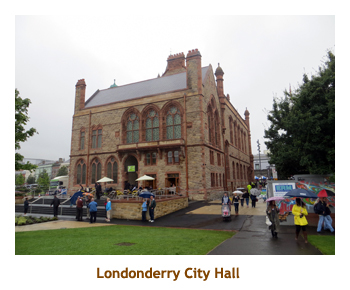 The main sights were the City Hall, Queen's University and Stormont Castle. We were back to the hotel for a pit stop by about 10:00. 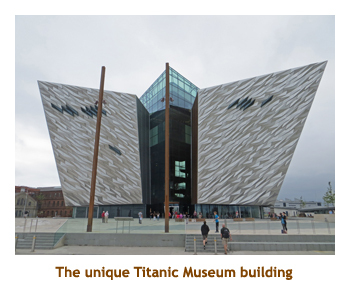 Then we drove to the new Titanic Museum (opened last year) which was really amazing. It is a unique building in the middle of a huge plaza. Themulti-level museum was excellent. It included an elevator ride up to the topof the ship to "work with the rivetors" on the girders. There was also a ride that takes you through part of the museum, reminiscent of the Disney Epcot Center. We also did a walk around the outside of the building on the plaza which bordered a large canal. We were given 2 hours for our stop at the museum and we used every minute of it. Then we drove back to the Cith hall (near our hotel again!) and were given an hour to find lunch. Marjorie and I decided to visit Marks & Spencers where we ate at the cafeteria. It was fine and reasonably priced. 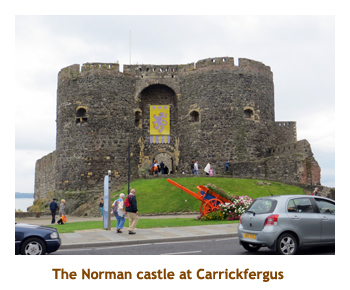 The tour continued at about 1:30 and we drove up the coast to Carrickfergus. There we stopped for about 30 minutes to view the large Norman castle and to walk through the village. One building had a huge mural painted on the side with interesting characters from the town. Then we continued up the coast and arrived at the Ballygally Castle Hotel about 4:00 PM. We checked in, did a quick tour through the castle (to see the ghost) and wandered the surrounding gardens. 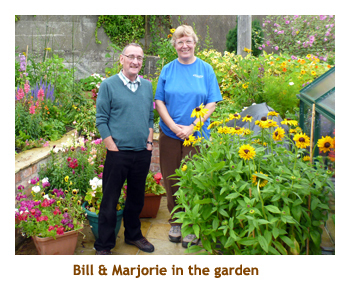 Bill arrived about 5:00 and drove us back to his house for some tea and a tour of his amazing garden. 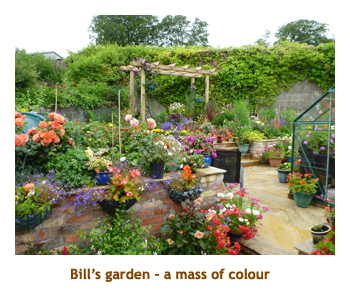 He had completely redone the back garden since we were last there. The sun poked through a couple of times lighting up the flowers. He had us back to the hotel again by about 6:45 as we were having a tour group dinner at 7:00. The dinner was very good. Afterwards we did a walk around the area again. We were directly across from the ocean, and surrounded by sheep pasture, so it was a very pleasant walk. Then we packed it in. 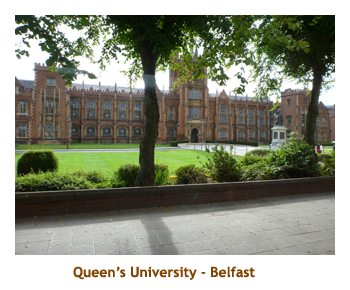 We had visited Dublin and Belfast several years ago, so we had so far just revisited where we had been before. However, today would be taking us to new country. Our 6:45 wake-up call was preceded with a 6:30 fire alarm. We were already awake, but it was kind of annoying. It was a false alarm, so we continued with the luggage, breakfast and checkout routine. It was a sunny morning, although it clouded up for the afternoon. 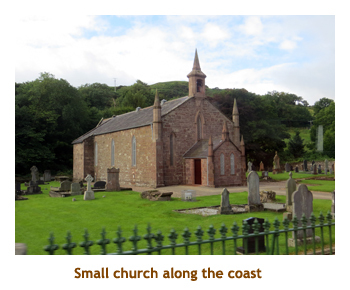 We drove up the Antrim Coast, through several small seaside villages heading towards the Giant's Causeway. As we drove along, Patrick (our guide) read us the story of Finn McCool, the giant that built the causeway. Our first stop was at Ballintoy to view the Carrick-a-Rede rope bridge. However, we couldn't see it from our viewpoint without a long hike down a large slope. 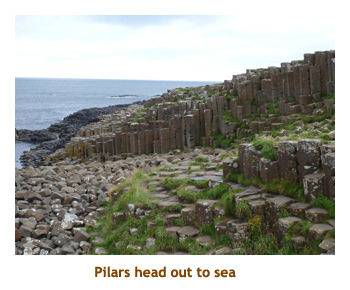 Just past Bally Castle (not to be confused with Ballygally Castle)and Bushmills, we stopped at the Giant's Causeway. It was overcast by this time, so it looked a bit drab. We were given audioguides and headed off on the walk down to the ocean. 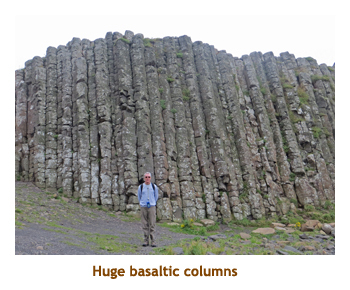 The basalt columns were very interesting. After spending about an hour wandering around the columns, we hiked back up to the visitors center and had lunch in the cafeteria. This still left us a half hour to browse through the small but interesting geological museum. About 1:00 we continued our journey arriving at the City Hotel in Derry about 2:00. We did a quick checkin and then joined a walking tour around the old walled city. It was overcast with showers at this time, so we broke out the umbrellas. Our guide was Ronan, a part chinese Bhudist who was born in Derry, so he presented an unusual viewpoint of the Catholic / Protestant difficulties in Northern Ireland. We wallked along part of the old city wall (complete with canons) and then through a lively bar area. 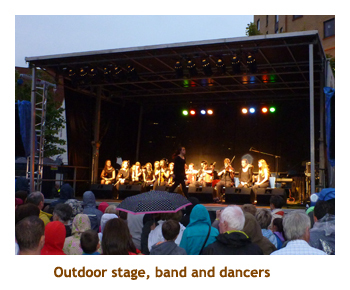 The city was humming with music as it was in the midst of hosting the annual "Fleadh Cheoil na hEireann" music festival . 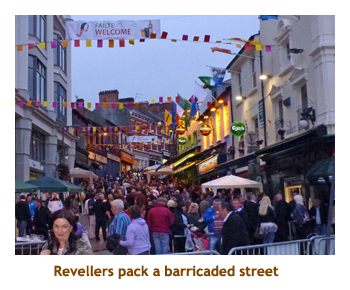 This was the first time that Derry had been chosen to host the event and they were making the most of it. 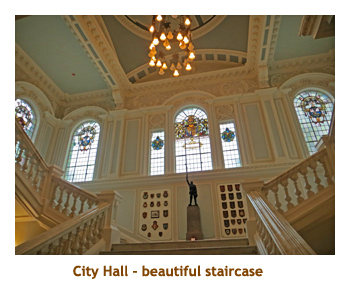 Our tour ended at the City Hall. 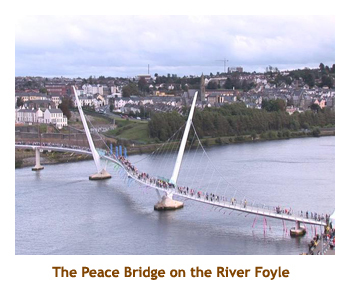 We continued our walking by crossing the Peace Bridge and back again. At the near foot of the bridge was a large craft and food market. The food looked very good! On the way back to the hotel we spotted a Tesco, so had to pop in for snacks. Then it was back to the hotel to get ready for our 7:00 PM group dinner. After dinner we walked around town again, listening to several performing groups. Beautiful!! Note: A very visible icon of the troubled times are the police cars which look like armoured tanks. 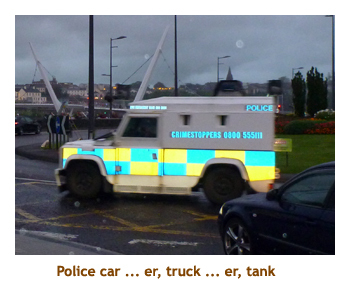 We saw several cars in Derry, and the police men were well armed. The usual process again - wakeup at 6:45, luggage out and breakfast at 7:30, checkout and onto the bus by 8:30. 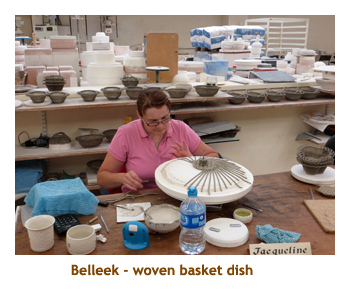 Today we headed south, our first target being Belleek. 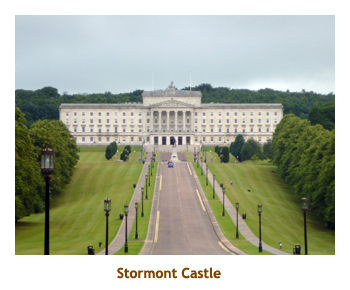 We drove down the Northern Ireland edge of the border until Strabane where we crossed over to County Donegal in the republic. Once again there was no sign of the border. We arrived in Belleek (back inside Northern Ireland) and were parked at the pottery factory by 10:30. It was a beautiful location on the banks of the River Erne. Inside the factory lobby there were 3 young teens (siblings) who played some music for us. We were given an hour for a guided tour of the factory and some time in the gift shop. 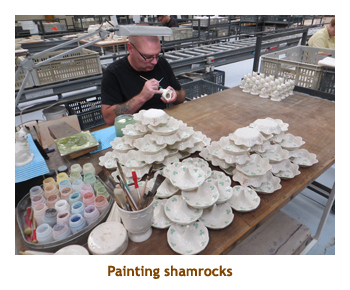 They had a lot of employees busy shaping, colouring and firing. 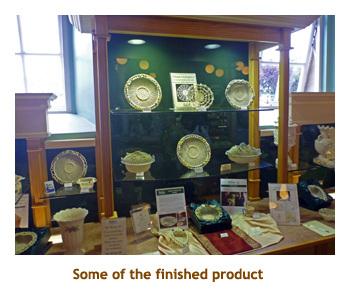 The Belleek pottery was certainly beautiful, but the prices were very high. Back on the bus we continued our trip south along the coast to the village of Sligo. Along the way we stopped at Drumcliff Church to see where the poet Yeats was buried. 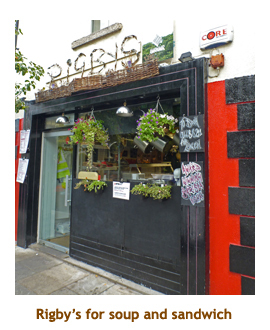 We stopped again in the village of Sligo where we were given an hour for lunch. The sun came out and it was beautiful! 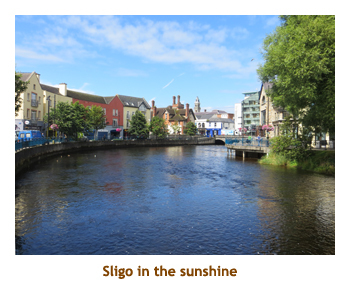 From Sligo we headed inland through Boyle and Castlerea. 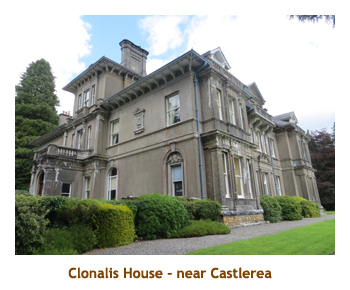 We were heading to Clonalis house, the ancient home of the O'Conors, traditional High Kings of Connacht.. At Castlerea the road was closed, so we had to detour along an "L" road which was very narrow and potholey. Eventually we arrived at the stately manor. Like so many of the homes, the expenses to run the place are enormous. Hence, the current owners, Pyers and Marguerite O�Conor Nash, have turned the house into a tourist museum and a bed & breakfast. 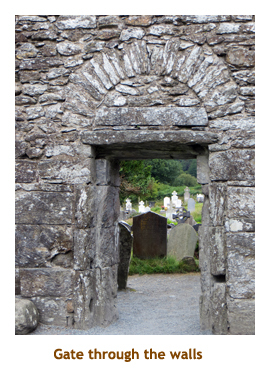 We visted 3 or 4 rooms that contained the history of the O'Conor Clan. Then it was off again on the final leg to Galway. 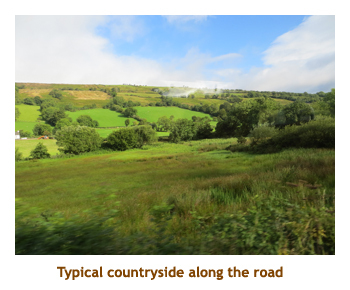 As we passed through Ballymoe, Dunmore and Tuam, Patrick read to us from the short story "The Quiet Man" which John Ford translated into the movie of the same name. Because of the length of the story, Patrick just read the first half today. As we passed Tuam, Patrick pointed out a small stone bridge that was in the movie. 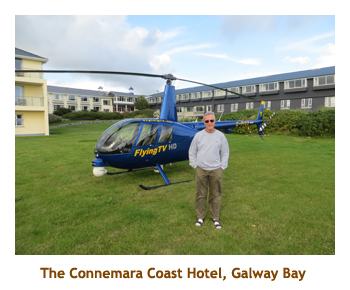 Finally we arrived at our hotel, the Connemara Coast Hotel, which was not in Galway but a few miles out along Galway Bay. As we were checking in to our room, an HD TV helicopter landed. I wonder what they were filming? We had a group dinner at 7:00, followed by a liesurely walk around the hotel property and along the beach.